Alleged Gunman In Virginia Shooting Called Himself 'A Human Powder Keg' : The Two-Way ABC News says a man claiming to be Flanagan sent a fax that arrived after the killings, and that the same person also called to identify himself as the shooter. A screen grab shows the Twitter page of Bryce Williams, whose real name is Vester Lee Flanagan II, who police say fatally shot WDBJ-TV cameraman Adam Ward and reporter Alison Parker during a live broadcast early Wednesday. After the attack, Flanagan reportedly sent a fax to ABC News. Vester Lee Flanagan, who police say shot and killed two of his former colleagues from a Virginia TV station before dying hours later of a self-inflicted gunshot wound, seems to have sent a 23-page fax to ABC News that discusses his reasons for the attack. The network says a man claiming to be Flanagan, 41, sent a fax that arrived after the killings — which occurred during a live broadcast — and that the same person also called to identify himself as the suspect, saying the police were after him. Franklin County Sheriff Bill Overton says investigators are examining the fax, which echoes some of the sentiments seen in tweets from the account of Bryce Williams, the on-air name Flanagan used while he worked at Roanoke's WDBJ TV. Those tweets alleged disputes with both the station that had fired Flanagan and with the two journalists who were slain: reporter Alison Parker and photojournalist Adam Ward. Overton said Wednesday afternoon that a clear motive has not been established. 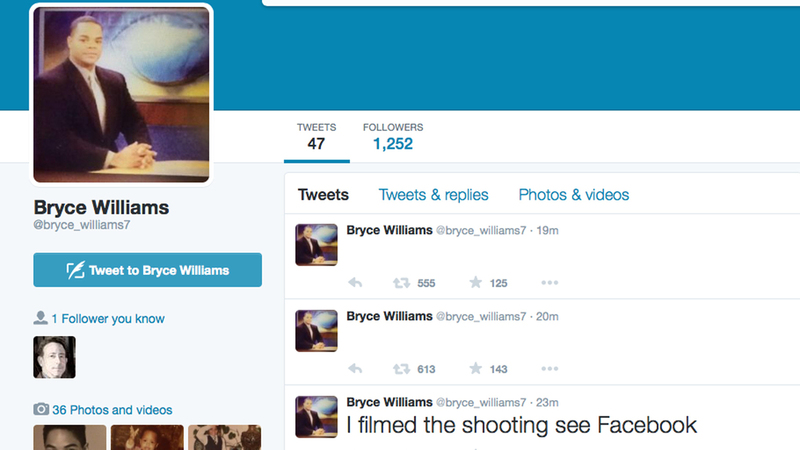 That same Twitter account — and Bryce Williams' Facebook account — also posted disturbing videos of the Wednesday morning shootings, as seen from the gunman's perspective. The footage has since been made unavailable on the accounts. "It's obvious that this gentleman was disturbed in some way," Overton said. "It would appear things were spiraling out of control." Excerpts of the fax, which ABC News posted after Flanagan was taken into custody, suggest that the shootings were inspired by other acts of mass violence, particularly the June shootings at a historic black church in South Carolina. "Why did I do it? I put down a deposit for a gun on 6/19/15. The Church shooting in Charleston happened on 6/17/15..."
"The church shooting was the tipping point...but my anger has been building steadily...I've been a human powder keg for a while...just waiting to go BOOM!!!!" The network also says that the message, which Flanagan called a "Suicide Note for Friends and Family," said he had "suffered racial discrimination, sexual harassment and bullying at work," as a gay black man. Speaking on WDBJ Wednesday, the station's general manager, Jeffrey A. Marks, said Flanagan had filed a complaint with the U.S. Equal Employment Opportunity Commission after he was fired. When contacted by NPR, the agency said it doesn't confirm the existence of complaints, citing its own confidentiality rules. According to court records from 2000, Flanagan filed a lawsuit against another former employer, WTWC-TV in Tallahassee, Fla., in which he accused it of racial discrimination. That suit was eventually settled between the parties. When asked Wednesday about any role that race might have played in the case, Sheriff Overton would not hypothesize. Overton also said that he had recently done a remote appearance with WDBJ's Parker and Ward — and that the news had "really stopped me in my tracks." "Like many viewers," he said, "I was watching this morning's broadcast, and couldn't understand really what was happening."